Thinking of signing up for this class? 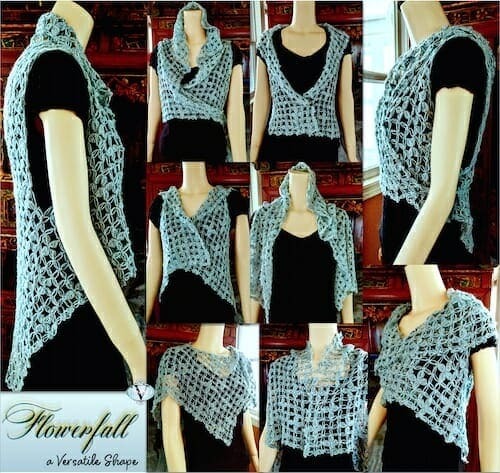 I wrote the Crochet Class in a Vest blog post with you in mind. Lovelace Ring Scarf pattern. Recommended blog post. Lovebud Vines (jewelry component) is part of the Candied Color Charms pattern set. Electra Love Knot Wrap pattern. Recommended blog post. Fish Lips Lace Scarf to Shrug pattern. 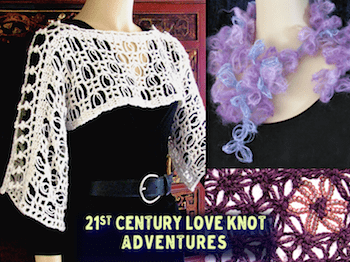 Sister Act: Convertible Love Knot Shawl and Shrug pattern info. Recommended blog post. Buffalo Knot Belt is my tie-belt version of a basic Love Knot Foundation. Free downloadable pattern. Sparkle Love Knot Lariat is a simple beaded jewelry cord. Pattern. Lovepod Boa features a “Lovepod” stitch variation: pattern. Embracelet is one of my first love knot designs. A free blogged pattern here. Also see this tutorial! ​Love knots serve as important examples for several different newsletter topics! #57, Which Beads Which Way? Recommended: my Love Knots Old & New Pinterest board. 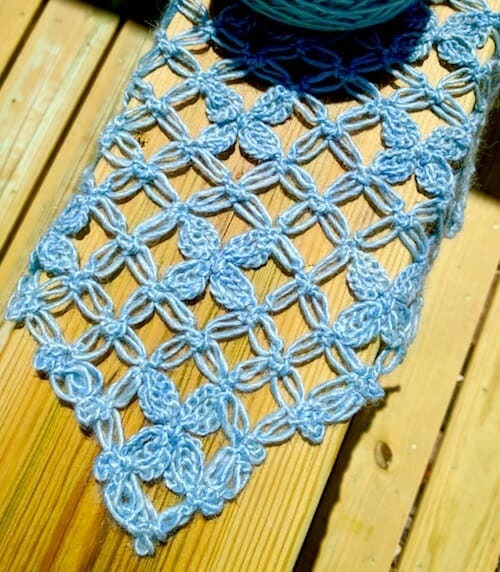 All of my crochet Love Knot projects in Ravelry (a self-updating collection). Make sure you’re logged in to Ravelry to see them all. A Crochet Love Knots Gallery I created in Flickr back in 2012. Fun! These are self-updating search results in Ravelry. All patterns with lovers knot/solomon’s knot in order of the most recently published first (437 patterns as of 4/05/18; it was 385 patterns as of 5/31/16). Here are search results for all love knot projects in order of most favorited first. Recommended! I updated and expanded the first two parts of this 3-part how-to post at my older blog. Any Books on Crocheting Love Knots? Yes! Jenny King wrote one: Crochet with Love Knots (Annie’s Crochet 2014). Portuguese: Ponto segredo = solomon’s knot. Love knot tutorial “punto loco de tejido“? 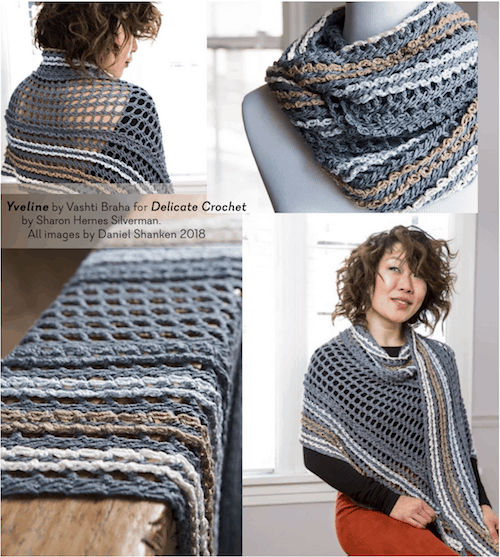 Below is a screenshot of Vashti’s beaded Love Knot projects in Ravelry as of 4/05/18. View full size. Older sources were first compiled for the 2012 class. All links work as of 4/05/18. Two edging patterns were originally printed in the book Ripple Sweaters, Yokes & Edgings by Adeline Cordet in the year 1920 (now in the public domain). James Walters’ Solomon’s Knot window hanging http://www.crochet.nu/scjwc/work/hangings/index.html. Excerpt: Only Solomon’s Knots show you how the yarn will behave when the individual strands within a stitch are allowed to separate and drape – some want to tension themselves like fine hair-springs from old watches, others are more squidgy and dribbly, and some, if they’re long enough and completely relaxed, will twiddle up into cork-screws.